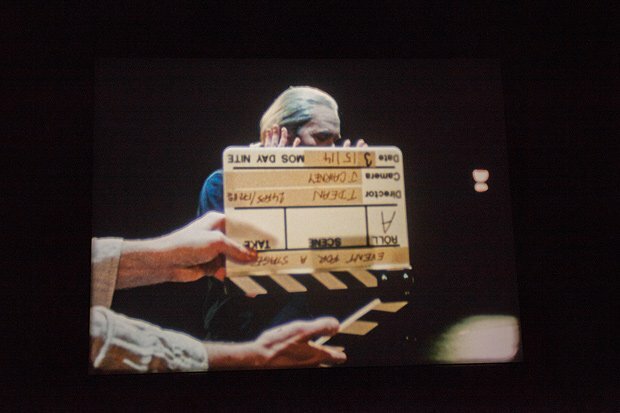 'I've always been slightly afraid of actors,' Tacita Dean confesses. Given that her Fruitmarket show Woman With a Red Hat (which opens hot on the heels of a trilogy of solo exhibitions running concurrently across London) is based entirely around theatrical performance, this sounds like an odd thing to say. Especially as its centrepiece, 2015's 'Event for a Stage', is an hour-long film featuring a solo performance by Tony Award-winning actor Stephen Dillane in a black box theatre space dressed as Oedipus. 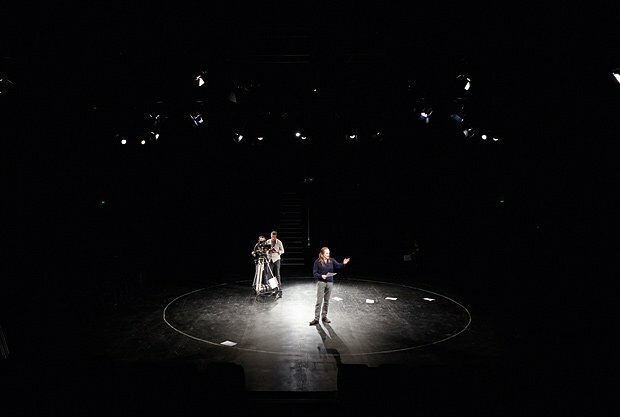 'Event for a Stage' was commissioned for the Sydney Biennale and filmed over four nights in an auditorium where Dean hands Dillane pages of a script one by one from the front row. There are reminiscences about Dillane's family, some storytelling, and lines from The Tempest, while the actor also announces the changing of film reels for the two cameras filming him. While in no way calculated, a sense of theatre has permeated throughout much of Dean's work. It was there perhaps most explicitly in 'Stillness', her 2008 film of Merce Cunningham performing to John Cage's composition '4'33'. It was there again in 'Play as Cast' (2004-2005), which enlarged a monochrome production shot of a play onto the safety curtain of Vienna Opera House. Then there is 'Die Regimentstochter' from 2005, comprising a group of 36 vintage theatre and opera programmes that she found in a German flea market.' Dean sat on them for a while, showed them at her 2006 show at Tate St Ives, and the work now belongs to the German government. This is why they won't be seen at the Fruitmarket. Two other works will. The blackboard-based 'When first I raised The Tempest' (2016) is a storyboard for an imaginary film while 2001's 'The Russian Ending' reimagines a set of found postcards as stills from fictitious disaster movies. Dean's grandfather was Basil Dean, a pioneering film producer who co-founded Ealing Studios, and went on to make movies with the likes of George Formby and Gracie Fields. Given that he died when she was 11, there is no direct influence, but she thinks that 'maybe hearing about all that left its mark'. With her theatrical beginnings, middles and possible endings presented as a body of work in Woman With a Red Hat, might Dean ever go the whole hog and enter the movie industry? Tacita Dean: Woman With a Red Hat, Fruitmarket Gallery, Market Street, 0131 225 2383, 7 Jul–30 Sep, Mon–Sun, 11am–6pm, free. Evening trails shine a light on Edinburgh Art Festival, with visits to works by Shilpa Gupta, Adam Lewis Jacob, Tacita Dean and more.